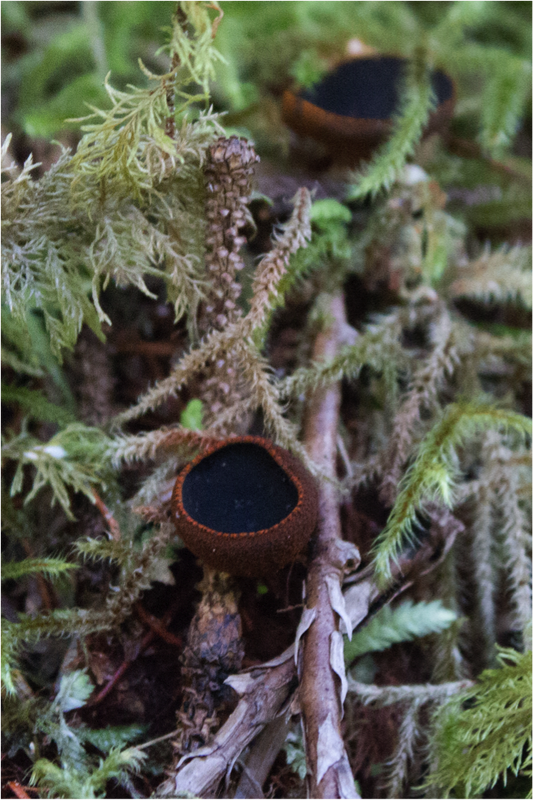 This small cup- or urn-shaped fungus is black with rusty orange granules dotting the outer surface, especially along the rim. It is initially closed, and is 1-2 cm wide when open. The inner surface is black with a smooth, gelatinous texture. The stem, if present, is 5-10 mm long and thick. This species is visible in May and June, and can be found growing individually or in clusters on decaying wood and bark from conifers. Similar-looking species, such as Plectania milleri, Pseudoplectania nigrella, and P. vogesiaca, are not dotted with orange granules. Gibson, I. Plectania melastoma (Sowerby ex Fr.) Fuckel. In Klinkenberg, Brian (Editor). E-Flora BC: Electronic Atlas of the Plants of British Columbia. Lab for Advanced Spatial Analysis, Department of Geography, University of British Columbia, Vancouver. Accessed 30/01/2015. Lincoff, G. H. The Audubon Field Guide to North American Mushrooms. New York: Alfred A. Knopf, P. 341. Kelly Fretwell and Brian Starzomsi (2015).